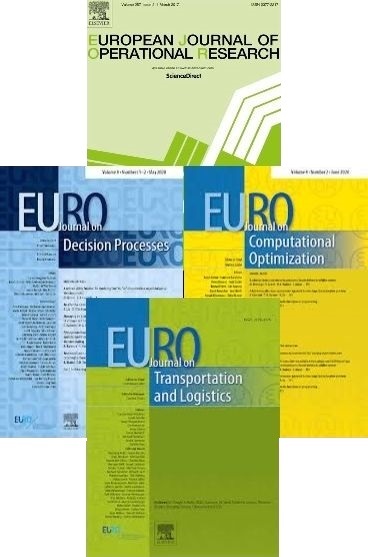 EURO supports international meetings on relevant OR topics by sponsoring a plenary presentation (The EURO Plenary) of an internationally renowned operations researcher (scientist or practitioner) from a EURO member country. EURO will hand out a certificate and pay the speaker a lump sum to cover the speaker’s cost (travel expenses and accommodation). The conference organizers will waive the conference fee for the speaker. Up to four events can be sponsored per year. The meeting concerns a relevant OR topic, is held in a EURO member country and open to everyone interested in the field. A reasonable number of participants (> 100) can be expected. The conference language is English. The meeting is held in one of its member countries, with the possible exception of Joint EURO International Conferences and IFORS Conferences that will feature a EURO Plenary even if they are held in a different country. The meeting is organized by, or, at least, supported by, a member society of EURO or another organization within EURO. Members of EURO member societies contribute significantly to the event, e.g. by participating in the Organizing, Program and/or Scientific Committees or by providing a significant share of the presentations. The scientific activity of the EURO Plenary Speaker takes place in a EURO member country. No speaker can be The EURO Plenary more than once in her or his lifetime. At the end of the presentation, a EURO representative will hand out a diploma to the speaker that certifies that the speaker has presented a EURO Plenary. Applications for sponsorship must have been received by EURO in the calendar year preceding the event and at least 12 months ahead of the event. Joint EURO International Conferences and IFORS conferences will be considered in the first place. Then, non-regularly recurring eligible meetings (including joint conferences of two and more national OR Societies which are held on a non-regular basis) will be considered for support. Regularly recurring conferences (e.g. annual conferences of individual OR societies) can only be supported once in three years. If not all applications for support can be satisfied, priority is given to non-regularly recurring meetings. EURO must be identified as a co-sponsor of the event. The EURO logo must be presented in prominent places of all promotion materials, on the website, in the abstract booklet etc. of the event. In all relevant materials (conference program, abstract booklet, etc. ), the presentation should be identified as “The EURO Plenary”. Within six months after the meeting, the meeting organizers provide a report about the meeting and the EURO Plenary.